« Nest Wins Best Ravens Blog in Baltimore. Thank You! 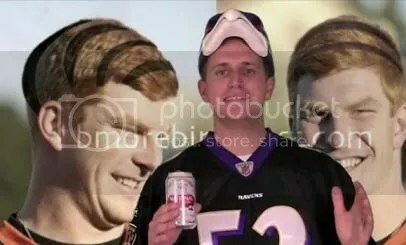 In this week’s GOOBVISION, Goob scores an exclusive interview with Bengals’ quarterback Andy Dalton, watches Pac-Man Jones make it rain, and enjoys a smooth Natty Boh. This entry was posted on November 16, 2011 at 2:17 pm and is filed under Goob's Videos, Hating, Humor, Ravens. You can follow any responses to this entry through the RSS 2.0 feed. You can skip to the end and leave a response. Pinging is currently not allowed.